New Free Download Coloring Page: What Can I Do? Thank you everyone for sharing the previous free download-able coloring page. The response has been really great! Church groups, mental health organizations, teachers, parents, and more have been sharing and using the sheet for themselves and in their communities. Also, thank you for sharing how it's helped you or how you plan to use the sheet within your own community. I appreciate you and really hope the sheet does continue to help in some way. I love doodling/drawing so decided to create another coloring page with a positive message. It's called What Can I Do?, and it offers suggestions on what we can do to get involved (in big and small ways) and provides art therapy through coloring. Check it out here. Do you have suggestions on what we can do to make our world a better place? And bring attention to important causes? Share them in the comments below. There's so much ugliness going on in the world. How do we process it all without going mad? At times it's tough alone getting through the daily motions, and then adding on top of that the pain and trauma around us? It's a lot. And as much as I believe in focusing on the good stuff and positive energy, it just feels too irresponsible to ignore the suffering. Here's a little something I hope will help with processing all the madness. Whether you're an adult at work distracted by the news or a parent trying to figure out how to facilitate a productive conversation with your child about the violence/poverty/injustices/trauma here is a little doodle/coloring page for you. You, your child, summer school students, or anyone can work through these prompts with writing, coloring, and doodling to put more emphasis on empowerment rather than hopelessness. It may not change the world (immediately) but it can help us think of ways to do so. I strongly believe that when we allow ourselves to feel what's happening and then put pen to paper some thoughts on how to make change, something happens. Ideas began to emerge and we start to see some solutions, and also feel that change is possible. You can download the doodle/coloring page here. Please feel free to share. Over the last few weeks I've been updating my Etsy shop with new artwork, including some collages I created in 2014. For the last two years I've been hoarding them but now excited to let them out into the world. The ones pictured here are a few of what's available on the shop (some of which have already sold). I will be posting more there over the coming days. Hopefully you see one that speaks to you! Feeling like you want to test out your coloring before purchasing or diving into your fresh copy of I Love My Hair? 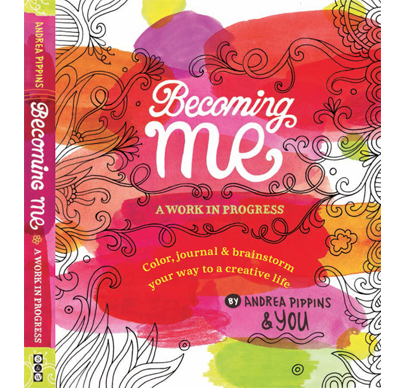 Or want to try a different coloring technique than what you used in your already broken in copy of the book? Well I have a little treat for you. You can download two pages from the book here? 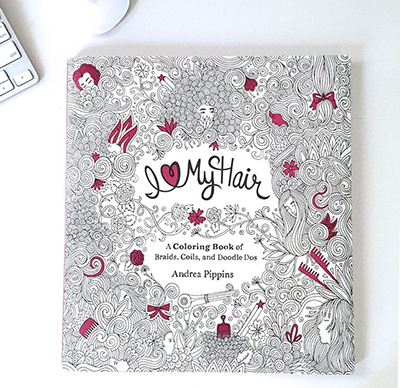 I'm having so much fun seeing how people are coloring the pages of I Love My Hair on Instagram. Have you been coloring in the book? If so, please share photos on IG and tag with #IHeartMyHair or me @andreapippins. I would love to see! In honor of National Coloring Book Day happening this Sunday (August 2nd) and in preparation for the I Love My Hair coloring book (out in November! ), I'm offering a free coloring illustration for you to download. You can download this patterned heart here. Disclaimer: Download of this item entitles the user to use for personal use only. Download of this item does not entitle the user to mass-reproduce the image (either digitally or in print) for resale. Please credit the artist when shared in posts. Last week I added a new print to the Etsy shop. She is called "A Manifesting Queen" which is a digital reproduction of an original collage drawing. The image is a visual reminder that we have the power to manifest our dreams. This is an archival quality print on 100% pure cotton Reich Savoy paper, which is acid free, recyclable and biodegradable. Wow, here we are at Day 21 already!! This has been such an amazing experience. I really didn't know what to expect, but with everyday I grew more and more excited to see what you all had to share. With that I'd like to end this challenge with doodles expressing my gratitude — including how grateful I am for your participation. Thank you for sharing with me, and sharing this challenge with your friends. The Doodle Challenge grew super fast because of your enthusiasm. We managed to create a little over 1,000 doodles in our doodle stream on Instagram. And that doesn't include all the amazing doodles that were shared secretly. This project has inspired me to continue exploring our doodling together in a different way. I am working on something that I can't wait to share with you. So please stay tuned! Also, I would like to know what you would like to do with your doodles now that you have so many little illustratons and preliminary designs to work with. Email me, comment below or post a comment on IG. In the meantime let's get to our final doodle together. Thanks again and I really hope you'll keep doodling on your own — or start your own doodle challenge. "Doodle 10 signs that have significance in your world. Maybe it's a street sign, zodiac sign, spiritual symbol, a personal logo, or a sign you'd like to see." Today's prompt comes from a special group of young people in Louisiana. They are part of an art club (they call themselves the Art Geeks) and their teacher, Ms. Kee, introduced them to the doodle challenge as a daily warm-up. I was so impressed with their participation that I asked them to give us a fun idea for doodles. So here it is: create a creature by combining 3 animals and an insect. In honor of Martin Luther King, Jr. Day let's doodle elements related to Dr. King and the Civil Rights movement. Dates, facts, people, places, etc. that speak to his legacy and how it impacted us all. Let's also be inspired by his determination, his vision and dream and doodle things we dream for ourselves, our families, community, and the world. It can be as simple as cooking a healthy meal or as big as traveling the world to teach children how to read. Here we are at day 17. Today we'll doodle carnival related things. You can go the cotton candy ferris wheel route, or West Indian/Brazilian style carnival with music, costumes, and dancing. Or both!